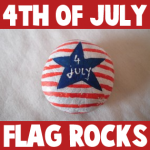 Here is a fun way to celebrate America’s Independence Day – Find a nice flat Rock and paint it in red, white, and blue. I have an awesome fall craft for you today. 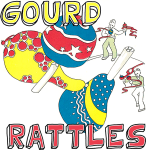 In this post I’m going to show you how to make Gourd Rattles and Maracas. When you fill these gourds with pebbles they make the most playful sounds. It is a festive way to use these gourds this fall season. The kids will love playing with these noise makers…. Not to mention the great fun they will have making this craft. So, grab the materials needed and let’s get started. HAVE you ever wished you could suggest a use for the interesting stones that children bring home? Here is an idea. By adding crepe-paper mache to these rocks, the children can produce interesting creatures of the imagination. 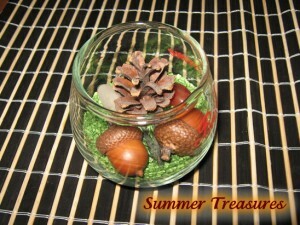 These can be used for paperweight gifts, but the experience of making them has its own reward. 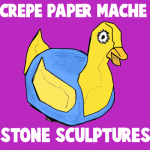 With crepe-paper mache children can make rocks into birds, animals, vehicles, fruit, vegetables, holiday novelties. Sounds fun, right? Sure does. So, let’s get started. Pet Rocks became popular in the 1970’s. It would be our equivalent of the virtual pet. It really doesn’t do much. It sits and keeps you company. But, one thing is for sure…. they are always super cute. 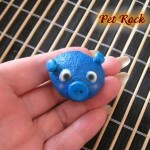 Today I’m going to show you how to make your very own Pet Rock. You don’t have to follow the craft word-for-word if you don’t want to…. feel free to use your own imagination to make your Pet Rock however you see fit. 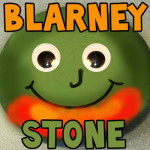 Blarney Stones are for the luck of the Irish and this Blarney Stone is super simple to make too. St. Patrick’s Day is coming up in the middle of March so it is time to star thinking about the arts and crafts projects that you can make to celebrate the grand occasion. Have fun. Have a free afternoon? 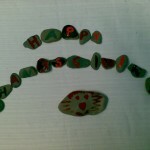 Go out for a walk, pick up some pebbles them and use them to make a thanksgiving greeting. 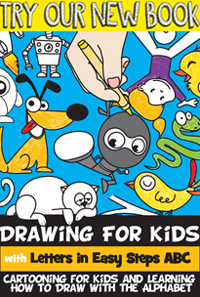 Its so easy that even pre- school kids can do it!! This crafts activitiy would make a great Thanksgiving table decoration or even centerpiece. Below you will find instructions for this Thanksgiving table decoration.